The rich sound, stunning appearance, and unrivalled playability of the Ibanez Premium series inspire players to new levels of performance. The new model, RG950WFMZ-TGE, features a Figured Maple top in "Tiger Eye" colour. 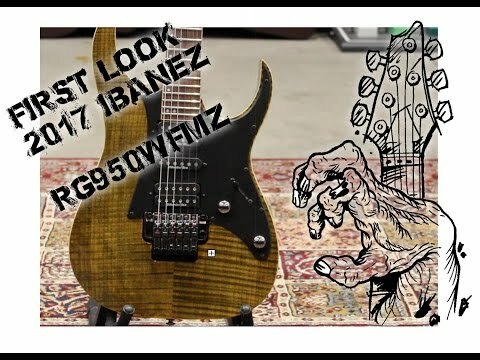 Alongside its gorgeous appearance, it provides the edgy functionality and utility of the Ibanez Premium series. The meticulous Premium fret edge treatment provides extra-smooth playing. Exclusive DiMarzio® Ibanez pickups, along with the 5-way switch, were chosen for the inspiring way they complement each other to create a wide palette of tonal options that add fire, retain clarity, and improve sustain. With the Edge Zero II bridge and Zero Point System, the most extreme sonic acrobatics can be fearlessly performed with confidence that the guitar will effortlessly return to perfect tuning.